Imagine having a dog that could turn on lights, pick up dropped keys or open a door. 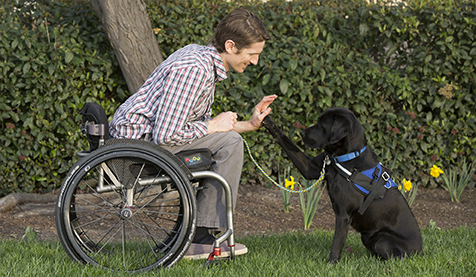 Canine Companions for Independence service dogs are partnered with adults with physical disabilities to assist with daily tasks and increase independence by reducing reliance on other people. A service dog can pull their partner in a manual wheelchair, push buttons for elevators or automatic doors, and even assist with business transactions by transferring money, receipts, and packages. A Canine Companions service dog not only assists with physical tasks, but also provides social support. During a two-week training session, participants learn how to effectively handle an assistance dog to maximize use of the 40 commands. Disabilities served include, but are not limited to, spinal cord injury, multiple sclerosis, spina bifida, arthritis and cerebral palsy. Canine Companions service dogs and follow-up services are free of charge.